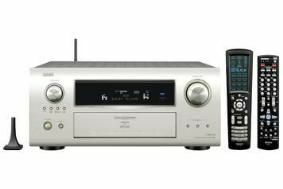 Denon announces the AVR-4810 'ultimate home cinema receiver' | What Hi-Fi? If you can, and you do, then the Denon AVR-4810 will be right up your street. Billed, by Denon naturally, as the ultimate home cinema receiver, and set for release in October, the receiver is undeniably extensively specified. There are nine on-board amplifier channels, each rated at 180 watts, and complete on-board HD decoding, alongside Pro Logic IIz and Audyssey DSX. This is also the first Denon amp to feature the Audyssey DSX setup through 11.3 channels, as well as the 4th-generation of Denon Link, claiming jitterless audio over HDMI. Six HDMI inputs, two video outputs, 1080p-upscaling, WiFi connectivity for Internet radio or streaming content. There are also two new optional Denon iPod docks, the ASD-51N and ASD-51W, for added functionality. Due out in October, the Denon AVR-4810 will cost £2800. On the subject of Denon, the November issue gives the price of Denon's AVR-2310 as £900: the correct price is £800. This, of course, doesn't affect its Group Test-winning status.